This is a series of photos from a repotting of an OLD Hawthorn from a few years ago. Pot is by the late Derek Aspinall, the soil mixture is very open and well draining. I have been working this tree for over 20 years, it has come together well with the branch structure maturing and the ramification filling out. 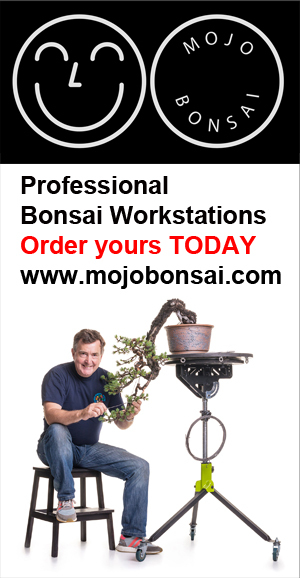 One of the challenges that face anyone creating bonsai is that they GROW not only above the soil but below, of course all trees need roots however sometimes the roots can cause problems such as oversize and out of scale to the tree, particularly with deciduous species. I have been working this hawthorn raft over 26 years, it has been re-potted 5 times, it tends to sulk for 12 months after re-potting, but it settles down the following season. At the end of 2015 I noticed that a major root was becoming too thick and changing the nature of the nebari of the tree. The other roots were in scale to the tree and were in sufficient number to sustain the tree if the thick root were to be removed. I did not want to remove the root during re-potting of the tree as such an intervention combined with disturbance of the whole root mass may have set the tree back or even threatened the life of the tree. At the end of the growing season I opted to remove the offending root whilst still in the pot, leaving the thinner roots emanating from the oversize root in place. These will be removed when total re-potting takes place in 18 months’ time. A VERY sharp saw was used and the cut was shaped with a Dremel and ‘nibbler’ finally the wound was sealed and covered with soil to encourage new finer roots to emanate from the cut. In the last photos you can see that the BIG root had been previously severed and callused well with two major roots formed from the cut. What looks older, an Uro or a Jin? My passion are deciduous trees and in particular Hawthorns, regular readers of this blog will be familiar with many of the hawthorns in my collection, this post is about the Raft and the Uro (holes) I have created over many years. I am not an advocate of jins on deciduous trees, mostly because the wood is soft and will rot in a very short time making the work pointless. This is different for hardwood trees such as Oak, Yew, Juniper where carving can enhance the appearance. When I create an Uro I cut deep into the tree to make a ‘dark’ interior, I want to create shadows and character. I also seal the cut with paste because I want callusing to occur, I want the callus to ‘roll over’ the hole. In some instances, the Uro has been completely seals by the callus.